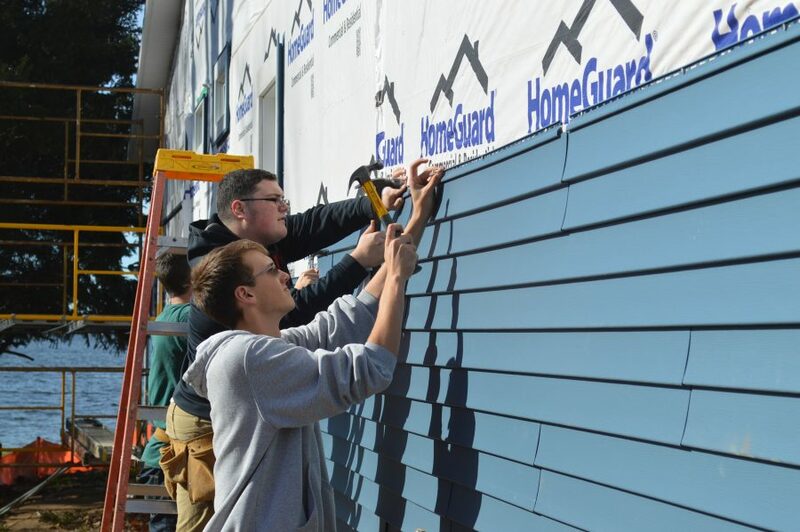 Wawasee High School students Caleb Bolt (closest to the camera) and Mark Graham work on installing siding on the home being built by building trades students at Syracuse Lake. Barely visible is a third student, Tanner Hampton. The home, along Eastshore Drive on the east side of Syracuse Lake, is being built for Jamie McAdams, an industrial technology teacher at Wawasee High School, and his wife, Linda. A cottage was torn down to make room for the two-story home with a crawl space underneath to be built. There will be three bedrooms and three bathrooms in the approximately 2,800 square feet house. A big feature will be a master bedroom in a balcony. As is typically the case with many new homes being built, there will be an open concept floor plan downstairs with family and dining rooms and a kitchen. “It’s a little more complicated because we are building on a narrow lot at the lake,” said Jeff McClure, Fairfield building trades instructor, when asked if there are any particularly new challenges being faced with this year’s project. Students of the three high schools, supervised by McClure and Ed Waltz, the Wawasee building trades instructor, are working together as they have for the last few years. Last school year, the garage for the home was built before the students started building a home near Fairfield High School in Elkhart County. There are approximately 36 students between the three schools involved in the building project. Jamie McAdams said he is particularly excited because several of the Wawasee building trades students came through the Geometry in Construction program he teaches along with Kem Zolman. 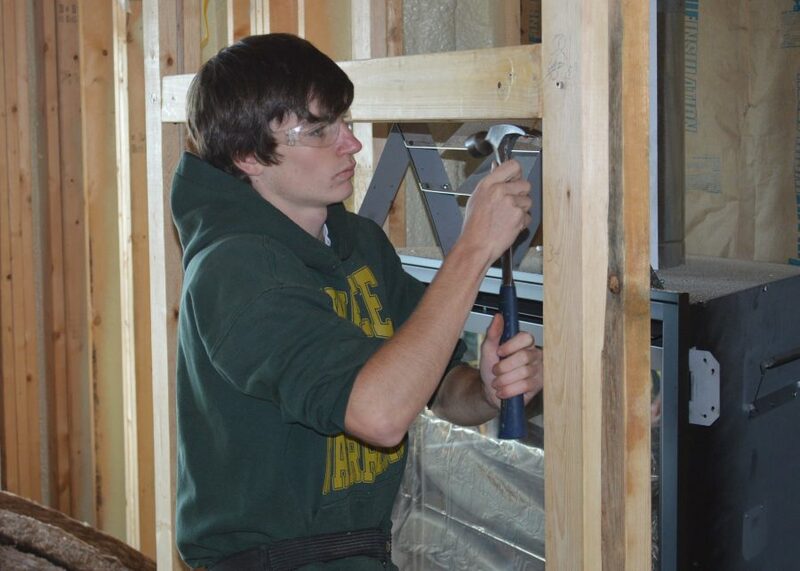 Wawasee student Samuel Griner works on the framing around the fireplace.